On day one of the Rising the 1st Battalion of Volunteers, led by Ned Daly captured the Four Courts. With only a lone guard manning the Chancery Place entrance, seizing control of the premises was uncomplicated and swift. However it was not long before the fighting began, with Daly’s men opening fire on a passing military convoy who were travelling down Ormond Quay. 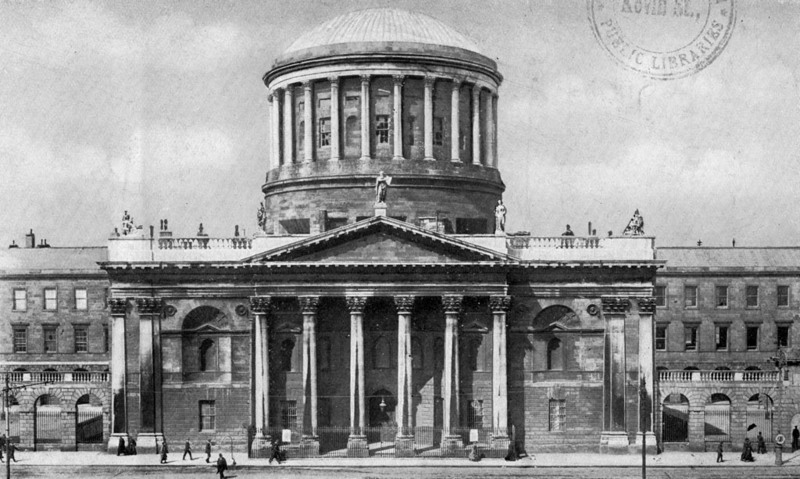 Like many of the rebel held locations around the city, the Four Courts was a symbolically significant location for the rebels to occupy, rather than a strategically practical one. Nonetheless this particular site was well fortified, and whereas fighting in nearby areas was intense, for those garrisoned inside the courts direct combat was sporadic and infrequent. However, as the fighting continued, it became clear that the British forces were slowly, but effectively retaking the city. With outlying areas cordoned off, the rebels were outnumbered and outmanoeuvred, and the Four Courts had become surrounded. On Saturday afternoon, much to the dismay of the Volunteers, the order to surrender came from their commander in Chief, Patrick Pearse. The rebels had successfully held the building, and most felt they could hold out longer. But, as impregnable as the Four Courts were, the option of adopting a siege-like stance against the reoccupying forces had become untenable.